Have you heard of the famous "Grapefruit Detox" and wondered about its effectiveness? While the results are overblown, there is something to be said about the healing power of this wonderful, bitter and sweet cousin of the orange. Even if grapefruit won't help you drop 10lbs (the way the fad diet promises), it is a great alkaline breakfast suggestion. What this means is that while you may feel that grapefruit is an acidic food, when you "burn" them in your body, they actually leave your body more alkaline thanks to their mineral content. Alkaline foods help your body cope with acidic refined choices you consume, like sugar, white flour and processed meats. Grapefruit slows down Phase I liver detoxification. This may sound like a bad thing, but it turns out that excessive amounts of toxic chemicals (such as pesticides) may cause hyperactivity or "induction" of this pathway. This can result in high levels of damaging free radicals being produced if Phase II detoxification can't keep up. Other substances that may cause hyperactivity include caffeine, alcohol, dioxin and paint and exhaust fumes. If your Phase II detoxification systems are not working adequately, these intermediates can cause substantial damage. By enjoying grapefruit, you can slow Phase I detox and let Phase II catch up, helping your liver balance out the workload. To learn more about how grapefruit can help you stabilize your blood sugar, watch my Meals That Heal TV segment here. 1. Blend up grapefruit seeds into your smoothie, if you dare! Grapefruit seeds are extremely powerful antimicrobial agents that are packed full of antioxidants.1 This bitter seed is a great addition to any digestive cleanse in order to ward off unwanted bacteria, parasites and fungus. 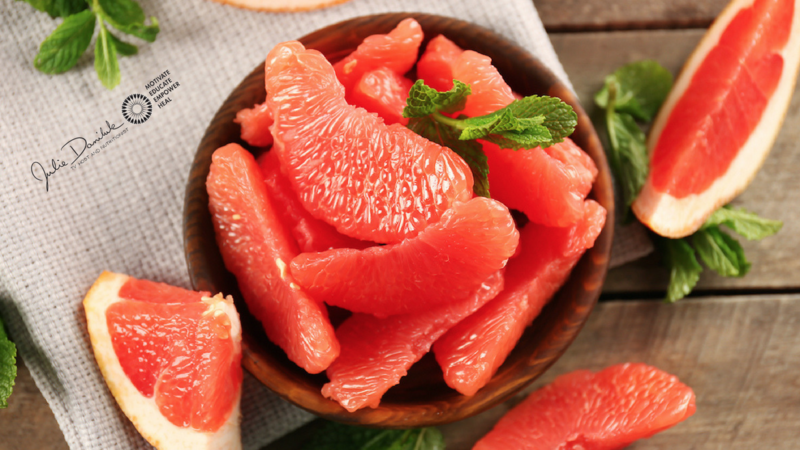 Stock up on grapefruit before you hit that tropical vacation this winter to prevent food-borne illness! 2. Grapefruit is a great source of Vitamin C, which has been shown to boost production of white blood cells which fight off pathogens. In recent studies, grapefruit has been shown to increase glutathione (powerful antioxidant) levels in red blood cells, giving you double the protection!2 If you're considering a cleanse, make sure to load up on Vitamin C so that your immune system gets the support it needs when toxins are released from your system. 3. Grapefruit can help reduce cholesterol. Grapefruit is packed with soluble and insoluble fibre, which binds to fats and bile in your digestive tract and eliminates LDL (bad) cholesterol.3 For a great cholesterol-lowering cleanse, combine grapefruit with other high fibre foods to aid in elimination. Grapefruit is also a low glycemic fruit choice, so go ahead, include half a grapefruit with breakfast to improve heart health. 4. Grapefruit has been shown to decrease the risk of breast cancer. Due to the high antioxidant content of this superfruit, grapefruit maintains the integrity of the breast tissue cells and prevents mutation.4 However, be careful if you are undergoing hormone therapy – the inhibitory action of flavonoid naringin may inhibit estrogen clearance from your system and put you at a greater risk. If you want to ensure that estrogen is being properly metabolized and eliminated, try pairing grapefruit with other sources of fibre to cleanse your digestive tract and allow proper elimination to achieve hormone balance. 5. Grapefruit can reduce the amount of drugs needed to get their desired effect. Grapefruit contains a flavonoid, called naringin, that has the ability to inhibit enzyme activity in your liver (Phase I) and in your intestine that breaks down drugs for elimination.3 This allows higher concentrations to enter your bloodstream. Grapefruit has been shown to have promising therapeutic use in cancer treatment, lowering the amount of chemotherapy drugs needed for treatment. This effect can allow for fewer drugs, thus putting less stress on our liver and allowing it to function more efficiently. Note : Grapefruit (like other fruits high in enzymes, such as pineapple and papaya) interacts with a number of prescription drugs so please check with your doctor before including grapefruit in your diet. When I speak about grapefruit, I often receive messages asking me to state that grapefruit is contra-indicated for certain medications. The interesting thing is, many other high-enzyme foods (such as papaya, starfruit and pineapple) are equally contra-indicated for the same medications affected by grapefruit. Beyond the blood pressure medication and grapefruit issue, there are hundreds of medications and medical conditions that require specific food restrictions. With such an extensive list, I must leave it up to you to know the restrictions that your doctor and pharmacist have laid out of you. For example, I must assume that if you're undergoing dialysis, your doctor has advised you to avoid oranges, tomatoes, dairy, chocolate, avocados, etc., or, if you're on a diuretic you've been advised to avoid celery, pickles, olives, coffee and nettle tea.